Best Ship in the Atlantic Fleet! Quote Reply Topic: Best Ship in the Atlantic Fleet! 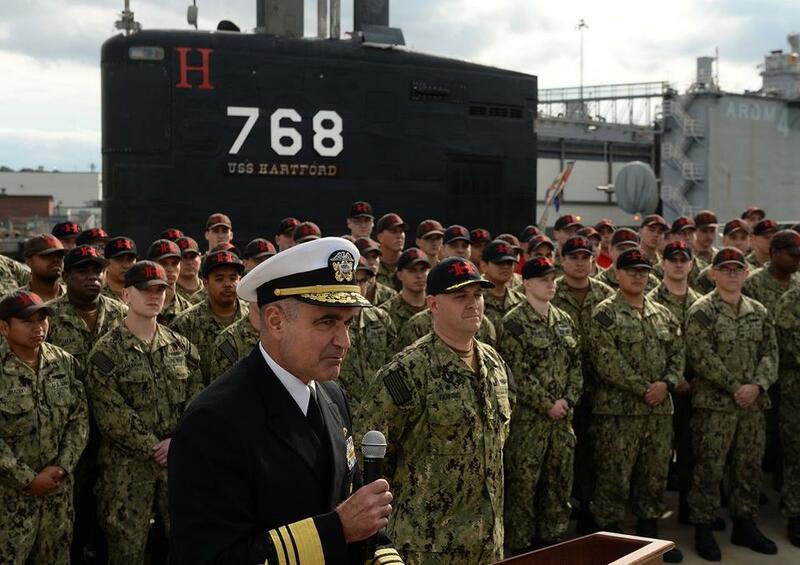 Groton — Embroidered on the crew's blue ball caps, next to the submarine's motto, "Damn the torpedoes, full speed ahead," is a small trophy, a nod to the coveted award they've received. But other than that small insignia, the crew does not intend to boast about their boat being selected as the best all-around warship in the Navy's Atlantic fleet — not a surprise from sailors who signed up to be part of the silent service. They all have their hands positioned in the same way, at least in the front. Maybe the Navy changed "parade rest" hand position. I still don't care for the pajamas. Great occasion calls for dress canvas. ... Great occasion calls for dress canvas. Agree completely, Tom. Lots of ither occasions. Months later I was an usher at the Commissioning of Will Rogers, last of the 41 - I wore the High Collar Service Dress White to the ceremony. Funny, when comuting to SUBASE we had to Slide our Foul Weather Jackets off so the Marine Guards would only see our short Sleeve Khacki shirts and pass us thru... freezing in January.